Tomorrowland has only one entry in the Halloween Time offerings, but oh, what an entry! Space Mountain Ghost Galaxy is a dressed up version of the popular indoor roller coaster with a spooky space ghost overlay. There are impressive projections inside, and it's definitely a little scary for those expecting just the typical innocent Disney attraction. But if that's too intimidating, there's always the outside, where a regular projection show takes place on the show building at nighttime. Accompanied by apocalyptic sounding music and sound effects, the visuals are quite spectacular. But then again, maybe those might scare the prone-to-craven. Sure is pretty, though! 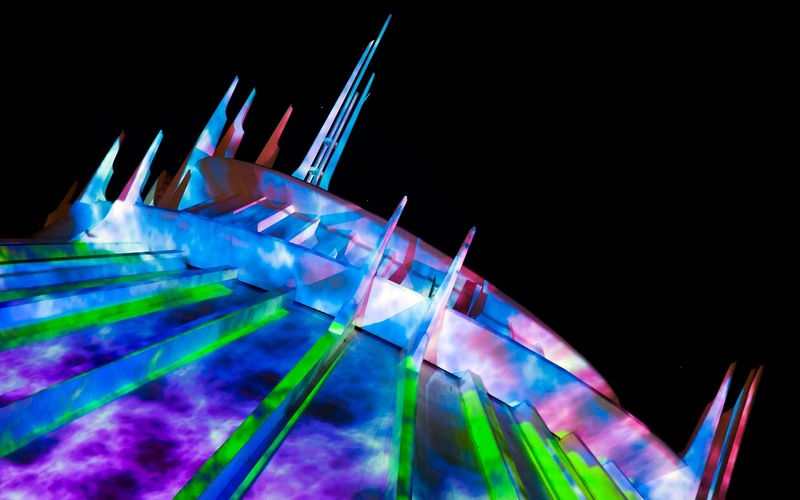 Space Mountain Ghost Galaxy features a wonderful projection show at night.